Be prepared for the tough challenges ahead. Sen. Bam Aquino made this advice to newly appointed Bureau of Corrections director general Ret. Lt. Gen. Ricardo Cruz III as he congratulated him on his new post. “General Cruz must be prepared for the tough challenges that await him in his new position. Many have failed to address these challenges, but with Cruz’s vast experience, I am sure he’s the right man for the job,” Sen. Bam said. Sen. Bam said among the challenges that will put Cruz to the test are the VIP treatment of moneyed prisoners, congestion and the alleged operation of drug syndicates inside the National Bilibid Prisons (NBP). “A caste-like system in our prisons is unacceptable. Justice will not fully be served if some prisoners still enjoy the perks and privileges while incarcerated while poor prisoners endure the worst,” the senator said. “The alleged operation of drug syndicates inside the prison walls must also be addressed immediately to prevent them from destroying more lives and families,” Sen. Bam added. The senator also urged Cruz to expedite the release of prisoners who have fully served the sentences or those eligible for pardon to decongest the country’s cramped prisons. “We challenge the new director to speed up the processing of the release papers of the inmates, who have served their terms dutifully. This way, the NBP would also be decongested,” Sen. Bam stressed. The senator also called on the government to implement thorough reform in the system in all BuCor prisons all over the country, making conditions more humane for prisoners. “They may be behind bars for their crimes, but they are still human beings who deserve humane treatment and we must not deprive them of that right,” the senator added. By implementing reforms that will help reform these prisoners, Sen. Bam said they would emerge better and more productive citizens for our society. 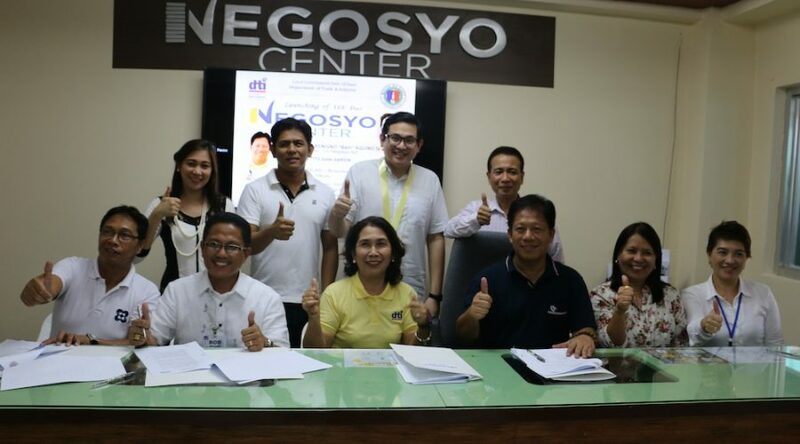 Sen. Bam Aquino, Daet Mayor Tito Sarion (third from left, seated), DTI Region 5 Director Joy Blanco and officials of other concerned government agencies show the thumps-up sign after signing the memorandum of agreement (MOA) for the Daet Negosyo Center. The Daet Negosyo Center, which was opened Wednesday (June 24), is the first LGU-led Negosyo Center in the country. It is housed at the municipal building of Daet. 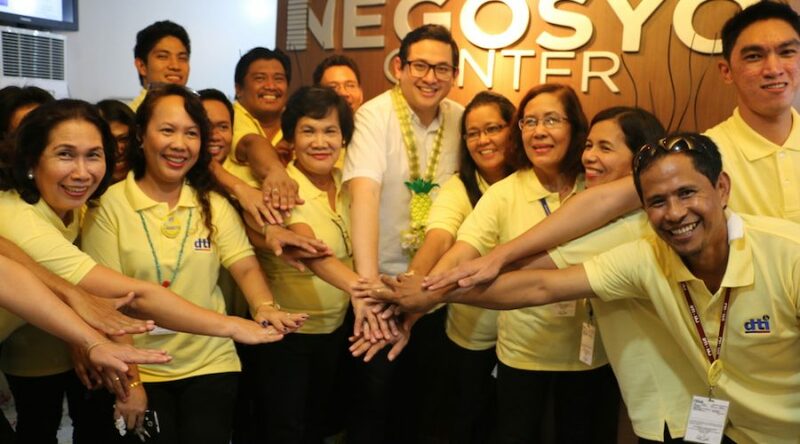 Senator Bam Aquino and officials of DTI Bicol Region display their unity after the opening of the provincial Negosyo Center in Daet, Camarines Norte Wednesday (June 24). In his speech, Senator Bam said the opening of the Negosyo Center in Camarines Norte will help further spur economic growth in the province. The major slump in trust and sincerity ratings experienced by the Senate during the corruption scandals last year makes Senate President Franklin Drilon’s current standing as one of the most trusted government officials a legitimate cause for celebration. The latest Pulse Asia surveys put Senate President Franklin Drilon in the top three most trusted government officials in the Philippines. In a recent interview, he attributed this turnaround to the hard work of the Philippine Senate – senators and their staff who have been working assiduously since the PDAF scandal last year. On our second year in the Philippine Senate, we were able to successfully push for three major bills that have now been ratified and are awaiting the President’s signature. One measure is the Youth Entrepreneurship Act, which incorporates financial literacy training and entrepreneurial courses in the curriculum of elementary, secondary, and tertiary schools across the country and gives promising young Filipinos access to grants and financing, mentoring, and training on enterprise development. Furthermore, a youth entrepreneurship fund shall be made to cater to youth entrepreneurs in the country. Training in financial literacy and entrepreneurship can equip students with the mindset and the skills to start businesses, which would have them create more jobs instead of compete for them. This is a means to reduce the alarming number of unemployed youth, reported to be at 1.32 million as of January this year. A second major policy awaiting the President’s signature is the Foreign Ships Co-Loading Act. Finally, foreign vessels will no longer be limited to one port in the country and shall be allowed to pick up cargoes to be exported or drop off foreign cargoes for import in various ports around the Philippine islands. This rudimentary amendment hopefully drives down shipping and logistics costs ultimately shouldered by consumers like you and me. That drop in shipping expense can be used by our Filipino entrepreneurs to improve the quality of their products, expand their services, innovate, and bring prices down. At the end of the day, it is the Filipino consumer who reaps the benefits of the Foreign Ships Co-Loading Act. The third and biggest win for our team is the Philippine Competition Act, a measure that also benefits both consumers and business owners alike. Three decades in the making, the Philippine Competition Act has finally been ratified and, hopefully, will be signed into law in the next few months. The last country from the ASEAN-5 to establish a competition law, our country will finally have a judicious policy that penalizes cartels, abuse of dominant positions and anti-competitive agreements. Once enacted into law, this measure will create a level playing field for all businesses, start-ups, micro, small, medium, and even large businesses. With more products and services to choose from, companies will be forced to improve product quality and, at the same time, drive prices lower. These three policies will improve financial literacy among Filipinos, cultivate a culture of entrepreneurship, and ensure a stable, fair, and healthy business environment for all businesses. We worked tirelessly to move these measures forward in the hopes of ushering in an era of inclusive economic growth, an era where no Filipino is left behind. Hopefully, these three new policies will continue the momentum of regaining trust in our institution; trust we should continue to build in the next administration and beyond. Sen. Bam Aquino, the youngest senator of the 16th Congress, made an impact during the second regular session as he sponsored three out of the six major measures ratified during the period. Foremost of Sen. Aquino’s bills was the Philippine Competition Act, a landmark measure seeking to level the playing field for all business, and eliminate anti-competitive agreements and abuses of dominant players in the market. The Philippine Competition Act was finally passed under Sen. Bam’s watch as chairman of the Senate Committee on Trade, Commerce and Entrepreneurship after 25 years of gathering dust in the legislative mill. Sen. Bam also co-authored and sponsored the Foreign Ships Co-Loading Act and the Youth Entrepreneurship Act. The Foreign Ships Co-Loading Act will now allow foreign ships carrying imported cargoes and cargoes to be exported out of the country to dock in multiple ports. This will reduce logistics costs and lead to lower prices for consumers. In addition, it will also lead to more efficient port operations and a more competitive Philippines in the ASEAN integration. The Youth Entrepreneurship Act, for its part, is seen as an effective tool to address the growing number of jobless young people in the country, which currently stands at 1.32 million. Financial literacy and entrepreneurship courses will now be included in all levels of education to build an entrepreneurship culture among Filipinos. A youth entrepreneurship fund shall also be made available to cater to youth entrepreneurs in the country. Last year, Sen. Bam’s Go Negosyo Act and the Philippine Lemon Law were enacted into laws and are now awaiting for the said three bills to be signed by the President. Once signed, Sen. Bam’s portfolio will consist of five laws in two years. “Hindi mahalaga kung neophyte o beterano sa senado. Ang mahalaga ay kung makakagawa ka ng mga panukala na makakapagpabuti sa buhay ng nakararaming Pilipino,” Sen. Bam said. Aside from these three measures, the 16th Congress also ratified measures ensuring the safety of children aboard two-wheeled motorcycles travelling along public and private roads, protecting the amateur nature of student-athletes in the country and the establishment of an open high school system in the country. “Ang pipiliin po rito ay siyang base sa qualifications, track record, and merits of the candidate and the assessment of the president, mahalaga po iyan. Wala namang masama kung talagang alam mong mabuti iyong tao at magaling pero mag-klaro yung basehan; very clear kung ano yung reason sa pagpili ng ating next PNP Chief. Napakahalaga po ng posisyong iyan. “Noong early 2000s, Iyong DPWH parang kakapit niyan yung corruption. Pag sinasabi, ay nako iyong daan na iyan ay dapat 1KM, bakit parang wala pang 100 meters? I will give credit where credit is due, ang laking bagay po ng tinatrabaho ni Secretary Babe Singson. Sabi niya, lahat ng pako ganito lang dapat ang presyo, lahat ng semento ganito lang ang presyo, lahat ng kahoy ganito ang presyo kahit ikaw ay nasa Region I or Region X, or XI or kung saan man, standardized ang presyo ng mga materyales. Parang 30% less, 25-30% less, ang mga presyo ng mga proyekto ngayon dahil na-standardize iyong mga presyo. Marami tayong natipid, kasi tayo po iyong nagbabayad niyan eh. Taxpayers’ money iyan; there was a time, mga 2012 or 2013, laging sinasabi ni PNoy, o buti pa ‘tong si Sec. Babes naka-save na naman ng 200 Million, ng 300 Million pesos kasi maganda iyong sistemang ginawa niya. “Grabe kasi ‘tong sunog na ito, maraming namatay, napakalaki noong sunog. Palagay ko, wag na nating payagan ang mga tragedy. Huwag na nating hintayin magka-tragedy ulit bago tayo gumalaw. Tayo na mismo -iyong mga korporasyon diyan, mga factory, tayo na mismo ang manigurado na safe para sa ating mga manggagawa. “To be fair kahit sa DMCI kung may permit sila dapat, may funding sila para ma-refund nila iyong mga taong bumili. Kung may permit sila , at talagng maayos iyong pagkuha ng permit. Kasi ngayon nagtuturuan na si Mayor Lim tsaka si Mayor Erap. Sino ba talaga ang may kagagawan niyan ‘di ba? Hindi na natin pag-uusapan kung saan tayo pumapanig, but definitely kung ang isang kumpanya, kumuha ng tamang permit tapos siningil, hindi naman magandang siya iyong i-penalize riyan ‘di ba. Kung wala kang tamang permit or may nangyaring magic sa permit, ibang usapan iyon. Pero kung tama iyong permit, para din naman sa businesses ‘di ba, pagiging fair na dumaan ka sa tamang proseso and then eventually wala. We agree, sabihin na nating hindi talaga maganda na nasa likod siya ni Jose Rizal, sabihin mo nang we agree. Pero may building na riyan, and hindi lang iyong pinanggastos diyan kasi gagastos pa para tanggalin yan. Ang tanong sino ang gagastos niyan? Kung ikaw ay isang negosyante, dumaan ka sa tamang proseso ng pagkuha ng permit, tama ba na mawalan ka ng pera? Or ikaw ay isang namili at binenta ito sa merkado at binili mo iyan pero hindi mo naman in-occupy, tama ba na mawalan ka ng pinaghirapan mong pera? Medyo hindi rin fair diba? Hintayin natin ang Supreme Court. Magiging landmark case iyan. Kasi, in the future, pag ang gobyerno pinatigil ka sa iyong negosyo dahil sa iba’t-ibang mga dahilan, valid reasons, kasi hindi naman natin sinasabing hindi valid iyong dahilan. “It was just a matter of time. Kasi ‘di ba pag ikaw ang tumatayong leader ng oposisyon, hindi mo na makukuha yung basbas ng presidente, iba na iyong kanyang pinagpipilian, tama na siguro na nasa kabilang panig ka na talaga diba. “Mayroon tayong tatlong batas na na-sponsor at na-author na handa na for signing ni Presidente. And we’re hoping bago po yung SONA mapirmahan po ito. Iyong una po diyan at pinakamahalaga ay ang Philippine Competition Act na siyang longest running bill ngayon po sa ating Kongreso. More than 25 years na po itong naghihintay na maipasa. This will finally prohibit cartels, abuses of dominant position tsaka anti-competitive agreements, lahat ng mga nang-aabuso sa ating merkado, nagpapataas ng bilihin ng presyo ng ating mga bilihin. Iyong pangalawa po riyan ay ang pagpayag na pumasok po iyong ating foreign ships handling import and export cargos sa iba’t-ibang mga port sa ating bansa. Isa rin ho itong mahalagang batas dahil pagginawa ho natin ‘to, bababa rin po yung costs ng logistics sa Pilipinas. Alam ho natin na iyong presyo po ng bilihin natin, malaking porsyento po niyan nasa logistics costs so hopefully bababa rin po yung presyo ng ating bilihin sa batas na iyan. Q: Sir, iyong Philippine Competition Act, gaano po katagal sir yung bill na ‘to? “Well, alam ninyo ‘no naging contentious po ito kasi ito po yung lumalaban sa mga monopolyo, sa mga abuso na malalaking kumpanya at sa mga anti-competitive agreement. Q: Sir, how will it affect status quo like the current state of the industry in the Philippines? “Unang-una iyong mga cartels natin. Recently, iyong onion and garlic cartels na nakita natin na nag-manipulate ng presyo at nagtaasan po. Finally may batas na nagsasabi na iyong ginagawa po nila ay siyang mali talaga at pwede silang makulong sa pagmamanipula ng mga presyo ng bilihin. Q: Sir how will you prove? “Mayroon namang case law diyan throughout the rest of the world, and that’s already a standard sa ibang mga bansa. In fact, if you look at our neighboring countries, marami sa kanila mayroon nang competition policy. Europe and the US, mayroon na sila niyan for the past 50, 60, 70 years. So there is already case law na pwedeng tumulong sa ating Philippine Competition Commission para ma-prove kung ano po iyong manipulated prices or ano yung cartel-like behavior. Marami naman pong examples sa buong mundo. But I think yung mahalaga is that finally, we have a body na puwedeng tumingin sa isang industriya at sabihin, kulang iyong kumpetisyon diyan or hindi fair. Q: Off-hand, ano yung mga industries na ito? Mayroon ba kayong in mind? “Well the cartels I think are quite clear, na sa maraming agricultural products kitang-kita na may nagmamanipulate ng prices natin. In the past couple of weeks some people have pointed to industries na kulang ang competition like the telecommunications industry for example where we only have two major players. Q: Paano nangyari na nakalampas kayo dun sa 25 years? I’m sure maraming naglo-lobby. “Yeah, marami namang naglo-lobby but I think nalagpasan ito dahil the Speaker, the Senate President, and the President all really pointed to this bill as one of the priority measures. Ang ekonomiya natin nag-mamature, nag-poprogress. Kailangan na natin ng ganitong klaseng mga patakaran, mga regulasyon, rules, rules of the game, para mas maging patas iyong laban para sa ating mga negosyante,. Q: Sir, may penalty yan under the admin? Q: Sir, what happens to an industry, like Telco, for example? Paano palalawakin anng competition? “We need to make sure that players can come in. Iyong pagpasok ng mga players depende yan sa regulation, sa rules, maybe even incentives, kung kinakailangan. Q: Sir, under the bill, bawal na yung mga no-players bibili ng big time kumpanya? Q: Sir, hindi po ba parang redundant na may trabaho na yung DTI tsaka SEC? Q: Sir, saan papasok yung penalties sa mga cartel lang? Q: Sir, yung resignation ni VP Binay do you think dapat sumunod narin yung ibang cabinet members na tatakbo? “Iyong pag-resign nasasa iyo yan. Hindi ko naman papangunahan iyong iba. In the case of Vice President Binay, I think its time has come for him to resign. “You have to ask her kung ano ang magiging desisyon niya. As far as the party is concerned, we’re still undergoing the consultation period and trying to find out kung ano iyong mga best combination para sa ating bansa. But right now, I think the choices of the party are all good choices, all people who want to continue the reforms and will be good for the country. Kung tungkol sa mga plano ni Grace, I think you should ask her. Q: Kahit outside the party? “Yes, yes. We need to find the best and the brigthest for our people. Mahalagang malaman natin kung ano bang gagawin nila para sa ating bansa. Lagi nating pinag-uusapan kung sino iyong okay, sino iyong hindi, sino iyong gusto nating iboto. No one’s asking the question that hasn’t been asked. Hindi pa tinatanong: “Ano bang gagawin nila para sa ating bansa, ano bang plano nila?” I mean whether it’s VP Binay, Sec. Roxas, or even si Sen. Poe. No one’s been asking that question. Ako, tanggalin mo yung pagiging senador, bilang isang botante, iyon ang gusto kong malaman. “Sec. Mar is the presumptive candidate of LP, pero palagay ko mahalaga rin na talagang tingnan, hanapin kung sino ba ang mga pinakamagagaling at pinakamabubuti. Q: Speaking of the laws, are you still willing on pursuing bills on anti-discrimination? “We’ve been pushing for the anti-discrimination law. Matagal na naming tinutulak iyan. We’re hoping we can get more support for this bill. This bill is not just on transgender, it actually includes religion, race, socio-economic standing, age – lahat ng mga posible maging dahilan kung bakit ka mag-didiscriminate sa iyong kababayan o sa mga ibang tao. We hope to make it outlawed at talagang prohibited na. Kasi sa palagay ko iyong kultura naman natin is one where we’re open, we’re tolerant, and we’re respectful of each other’s beliefs and each other’s lifestyle. Mga Bida, muli na namang napatunayan na may magandang resulta kapag nag-uusap-usap at magkatuwang na sinusolusyunan ng dalawa ang isang problema imbes na mag-away at mag-iringan lamang. Ganito ang nangyari sa isyu sa lupaing kinatatayuan ng Philippine Children’s Medical Center (PCMC) sa Agham Road sa Quezon City. Humigit-kumulang 34 na taon nang nakapuwesto ang PCMC sa nasabing lupain. Subalit sa panahong iyon, hindi sa kanila ang lupain at nakikitira lamang sila rito. Matagal na sanang napasakamay ng PCMC ang lupa ngunit hindi natupad ang kasunduan sa pagitan ng Department of Health (DOH) at National Housing Authority (NHA) noong 1992. Sa nasabing kasunduan, ipinagpalit ng DOH ang 5.9 ektar­yang lupain nito sa Cebu para sa 6.4 ektaryang lupain ng NHA sa Quezon City, kung saan ang PCMC. Subalit isang bahagi lang ng kasunduan ang naipatupad nang ibigay na ng DOH ang lupain sa Cebu at naipamahagi na ng NHA ito bilang bahagi ng kanilang socialized housing para sa ating mga kababayang Cebuano. Ngayon naman, pinursige na ng DOH ang paghahabol sa lupain sa Quezon City para sa PCMC, ngunit gusto naman ng NHA na bayaran sila batay sa halaga ng nasabing ari-arian noong 2003. Alalang-alala ang mga pasyente, nars at mga doktor ng PCMC na baka anumang araw ay paalisin sila ng NHA sa lupain. Kaya halos araw-araw ay nagra-rally ang mga taga-PCMC upang mabigyan ng solusyon ang problema. Nang malaman natin ang problema, agad tayong naghain ng resolusyon upang maimbestigahan ang nasabing isyu. Sa mga unang pagdinig, nagmatigas pa ang dalawang panig. Ngunit sa patuloy na pag-uusap, pagpapaliwanag at pakikinig sa isa’t isa, nagkasundo na sama-samang kikilos para sa kapa­kanan ng libu-libong batang Pinoy na nakikinabang sa de-kalidad na serbisyo ng ospital. Matapos ang ilang pagpupulong, nakabuo ng isang memorandum of agreement (MOA) ang DOH, PCMC at NHA para sa paglilipat ng titulo ng lupa sa PCMC at gagawan ng paraan ang mga kailangang bayarin sa susunod na mga taon. Sa ginawang MOA signing kamakailan, ilang mga batang pasyente ang personal na nagpasalamat sa pamamagitan ng pag-abot ng bulaklak at mensaheng nakasulat sa kapirasong papel. Sa kanilang mensahe, nagpasalamat ang mga pasyente sa sama-samang pagkilos ng lahat upang maibigay na sa PCMC ang inaasam nitong titulo ng lupa. May dalawa pang bata ang nag-alay ng awitin para sa mga panauhing dumalo sa MOA signing. Kitang-kita sa mata ng mga munting anghel ang kasiyahan ngayong mananatili na ang PCMC sa kasalukuyan nitong kinatatayuan. Napakita natin na kayang masolusyunan ang mga problema ng ating bansa kung tayo ay nagtutulungan at bukas na nakiki­pag-usap sa isa’t isa. Kaya pala nating isantabi ang ating mga pagkakaiba-iba at magkaisa para sa kapakanan ng ating mga kababayan! Mga Kanegosyo, sa ating lingguhang programa sa radyo na “Status Update,” iba’t ibang negosyante ang ating itinatampok at binibigyang pagkakataong maikuwento ang kanilang karanasan sa pagnenegosyo. Ang kanilang mga kuwento tungo sa tagumpay ay bukas-loob naman nilang ibinabahagi sa ating programa para na rin sa kapakanan ng mga nais magsimula ng negosyo. Isa sa mga naging panauhin ng programa ay si Archie Valentin, isang batang negosyante na nakilala natin sa isang pagtitipon ng Pasay Youth Council. Sa ating kuwentuhan sa kanya, nalaman nating nagsimula siyang magnegosyo noong nasa elementarya pa lamang siya. Gamit ang naipong P200 mula sa kanyang baon, nagbenta siya ng bukayo na gawa ng kanyang lola. Mula roon, kumita siya ng P700 kada linggo sa pagbebenta nito sa mga kaklase, na naging sapat para punuan ang pangangailangan sa pag-aaral. Pinatikim niya muna ang kanyang produkto upang malaman nila ang masarap na lasa ng produtko. Kahit marami na siyang mamimili, nais pa rin niyang magkaroon ng sariling tatak na negosyo. Nagkataong ipinamana sa kanya ng mga tita ang negosyo nilang empanada, na itinuloy naman niya. Dito niya sinimulan ang Archie’s Empanada. Sa tulong ng mga kaibigan, unti-unting nakilala ang kanyang produkto. Ngayon ay nakaabot na ito sa iba’t ibang bahagi ng mundo, maging sa Japan, Amerika at Singapore. Mga Kanegosyo, ayon kay Archie, ang pinakamahirap na aspeto ng kanyang mga negosyo ay ang gumawa ng sariling pangalan at pagpapakilala nito sa merkado. Una, napakahalaga raw na dapat de-kalidad ang produkto. Sa kanyang karanasan, napakasarap ng bukayo ng kanyang lola kaya marami ang bumibili dati. Napakasarap din ng kanyang empanada, na dinalhan kami noong nakapanayam natin siya. Bukod dito, mga Kanegosyo, binigyang diin din niya na ang marketing sa pagnenegosyo ay kasinghalaga ng kalidad ng produkto. Walang sawa niyang pinag-uusapan ang kanyang mga produkto sa mga kaibigan at kliyente. Ibinunga nito ang pagbubukambibig din ng kanyang mga mamimili at sila na mismo ang nagsasabi sa iba na masarap ang kanyang empanada! Pinalitan din niya ang kanyang packaging, na siyang bahagi sa marketing at pagbebenta ng kanyang produkto. Sa una, sampung piso lang ang benta niya sa empanadang nakabalot lang sa plastic. Nang gawin niyang karton ang lalagyan ng empanada, nagmukha itong sosyal kaya naibebenta na niya ito ng kinse pesos bawat isa. Mga Kanegosyo, ayon sa kanya, kahit nagmahal nang kaunti ang kanyang produkto ay mas dumami naman ang bumili. Sulit daw na inayos niya ang kanyang packaging ng empanada dahil gusto ng mamimili na maayos na nakapakete ang produkto. Ginamit din niya ang social media para patuloy na pag-usapan ang kanyang produkto at maibenta ito sa mas malaking merkado. Sabayan natin ang ating de-kalidad na produkto at serbisyo ng magandang packaging at kaakit-akit na marketing strategy upang mas mapansin ng mamimili ang ating negosyo! “I think everyone here knows the importance of the Internet, the importance of ICT in our country, it’s a connection to our economic growth, its connection, of course, in supporting our SMEs. If you listen to the speeches of the President, the Secretaries, and some of us in the Senate, we always hear two things – inclusive growth and tuwid na daan. In fact, I think, those two phrases are the two most repeated phrases of this administration. The tuwid na daan, which is a push for good governance, and of course inclusive growth, which is a push, such that a growth, our economic growth doesn’t just benefit those in Metro Manila or Cebu or Davao, but would benefit the majority of Filipinos. You look at ICT as the great provider, as the great leader. Earlier we talk about the SMEs, how further developed and supported through the right ICT infrastructure. When you look at where our country is and when you look at where poverty is, we sometimes look at poverty as lack of access, a lack of access to markets, a lack of access to grocery services. But more and more, I think it’s also a lack of access to good quality Internet infrastructure. The more we progress as a country, the more the world develops, where it’s developing now. So before we able to really push for Internet in all areas of the Philippines, I think it goes hand in hand with our push for inclusive growth. Earlier, Secretary talked about the one store project, where just by putting that supplier all through the net, they were able to access markets. Take note, that probably, less at least cost to them, they didn’t have to put up a store in a mall in Metro Manila, they nearly have to go online, post their products there and immediately, they were able to find the market. The Internet is truly a great equalizer, and when you talk about that in commerce, it’s probably one of the best platforms for our SMEs now. I think a lot of SMEs are still looking for cheap capital, but second to cheap capital would probably be that access to markets. That access to markets can be done through to the Internet. So when we talk about inclusive growth, it’s impossible not to talk about the Internet as well. As we push for inclusive growth, we need to put these, also, as one of the indicators of how we can achieve inclusive growth and earlier, I was whispering to Sec. Montero, maybe it’s time that we see the Internet in our mega plans, the Philippine National Plan, because we do have a Philippine Development Plan. I was asking, “Sec., mayroon ba riyang tungkol sa Internet?” Sabi niya, so far wala pa. We need to put something specific in the Philippine Development Plan with regard to the Internet. The second is tuwid na daan. I was reading this article in my phone this morning, and it’s from Forbes.com. It was a foreign journalist talking about the drop of corruption in the Philippines. It cited two things, on why it takes dropping of corruption in the Philippines. The first he said was, well because, President Aquino, is unlike, the previous presidents, is not willing to play ball when it comes to corruption. He points two things on why corruption has been going down, one is, as a major policy push from the president and from the secretaries, and two, is because social media has permeated all of our lives. These days, if you see, a congressman, a senator, a mayor, or someone related to them, you know, driving a fancy car, or doing things which are untoward, or unbecoming of their position, you can rest assure, it will be in Facebook and Twitter in a few minutes. To be frank, that vigilance, I think, has also stopped corruption. I mean, kung noon nga po ‘di ba, sa mga ibang ahensya, hihingan ka ng pera, lantaran, eh ngayon ilabas mo lang iyong cellphone mo, kinakabahan na iyong gustong humingi sa’yo. It does make a good point that in our push for tuwid na daan and push for good governance, you know at the end of the day, yes, leadership’s important but it’s also important that the people are involved. The people are involved should be enabled through ICT. They’re enabled through social media. They’re enabled through technology, to be as vigilant and to be as participative in the tuwid na daan. So seeing how important it is, for those two standards, I think it’s really time that we make that important sustained push for bearing ICT in the Philippines. We did improve, in the World Economic Forum Index, we went from 78 to 76. Umakyat naman po tayo from 2013 to 2014, but I think all of us here are looking for the leap. We’re not looking for a two spot increase, we’re looking for a leap that pushes us up in the future. So recently, we were able to pass the Philippine Competition Act. This has been the longest running bill in Congress. The first time it was filed was at the 8th Congress, which is about 25 years ago. But just a few weeks ago, we were able to pass it. I just found out that today how the Feldman Gray Commission, which will be the counterpart of the Philippine Competition Commission in the Philippines fined Apple for 415 million dollars for anti-competitive practices. Maybe, the Philippine Competition Commission can also do that when it is finally created. They will be able to police our markets, outlaws anti-competitive behaviors, cartels and abuse of dominant positions. Where we are now, 5 years of good economic growth and another 7 to 10 years of high economic growth, perhaps we might be up at edge of being in the middle income in economy already. Malapit na po tayo and having that, being in that position, being in that demographic suites far from growth can go have a best economy in the ASEAN, being the second best economy in Asia, next to China. Currently, sabi ko, this Philippine Competition Act, is a long stance act because how can you enter the big leagues, how can you enter the status of being in middle income economy without even having the right competition policy? It’s a basic foundation for all of the modern and developed economies. Alangan namang tayo po, we will enter that status without this foundation of law. In the same way, I look at that Internet infrastructure in the same way where any with middle-income status we’re becoming, you know, we already are. It’s so hard to put more heads, can you imagine, we’re entering this level already and our Internet is the slowest in the ASEAN. It doesn’t make any sense for me. Improving our Internet infrastructure and pushing for better IT should be our priority. The only promise I can give is that we’re committed to make sure that the developments and advancement in this industry is something we will not let go of.